I would prefer to build one out of mostly metal, with the heating elements on the top, so the frame with the plastic sheet will just have to be dropped down onto the mold. More Toys Erm. I Mean Tools! A couple days ago, a whole list of new tools have arrived in the shop! This means an end to our big ticket spending. Thank you so much Ontario Trillium Foundation http://www.otf.ca/ for the money you have provided us with to spend on new tools and equipment around the shop. 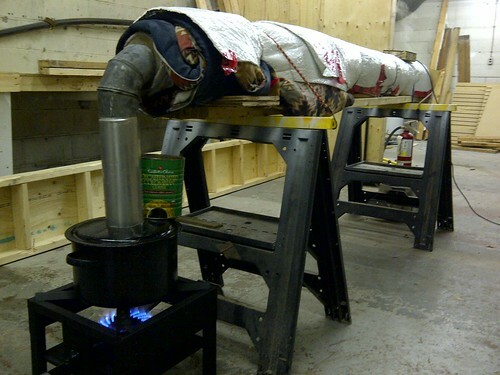 It has made a great addition in our shop and added to the collaborative team building spirit around our shop. Never again will you have a dull chisel with this nifty tool. Makes a perfect dovetail joint every time! A full and complete list of all the tools we have ordered will be available soon. If you’d like to get up close and personal with our new tools, come by the shop on Mondays at 9. New people always welcome. DIYode recently got a shiny new cherry red plasma cutter! Our President, Simon, gleefuly made short work of an available spare 1/4 inch metal disc we happened to have around. 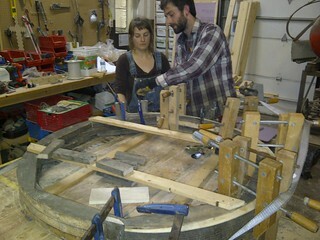 Recently, Alex Ciccone did a series of wood lathe workshops. Several lovely bowls and pens were turned. This inspired Matt Harding to get started on his own project. With a few types of wood he found at the shop, he sawed, planed, glued, clamped and glued again to make a solid multi-toned block from which he turned this bowl. Notice how the grain shows up particularly well in the light wood. Looks great Matt! I’m sure your new bowl is being enjoyed in its new home. Thank you to those that keep all the tools at DIYode working! Thank you again to Alex Ciccone for the loan of the wood lathe, and thank you also to Alex Storey for the loan of the wood planer. 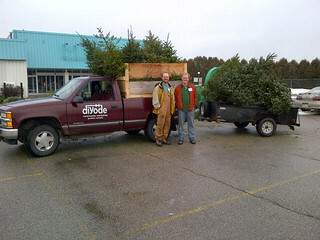 DIYode members were on hand Saturday January 12th to help out with the Trees for Tots Christmas tree pickup in Guelph. We were one of 40 teams tasked with picking up 1500+ trees from across the city. Each team was given a list of pickup addresses and a map. Most teams had a pickup truck or trailer. DIYode went one step further by using our member-use pickup truck and a 6×12 trailer. Here’s a picture during our first tree drop off. There are 30 trees in there somewhere! At the end of the day DIYode collected 56 trees and $614 in donations! While the suggested donation for each tree picked up was $5; the average was over $10 per tree. There were some people who donated significantly more! Thanks to everyone for their donations and to the Childrens Foundation of Guelph & Wellington for organizing this event. New Space! 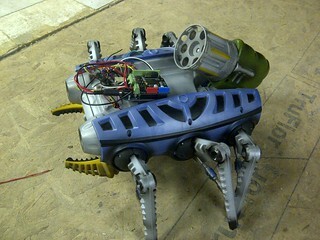 – Diyode has just acquired some new square footage in it’s current building. We are now working on renovating and organizing the new space to best suit our needs and maybe we’ll get some new equipment along the way. Please, if you’re interested in the new space and have some ideas for what could be used for, come join us for our weekly Monday night meeting. Come box with us! This Saturday, January 12th. Our second BoXshop is coming quick! Like a cold block of blue steel – at 11am this Saturday Paul our superman eco-contractor from Toronto will begin instructing us in the art of framing & mounting. * Goal 1. Mount the external insulated wall onto the outside of the box. * Goal 2. Frame & install sweet french doors. * (Goal 4. )Use donated lumber to begin framing second story. Not only do I need your helping hands to build this, I know there’s a ton of value in learning how use the tools we have in a friendly group setting! receive instruction from a green building instructor, Paul Horrigan.